The Samoa Islands are part of Polynesia, a triangular area of the Pacific bounded by Hawaii, New Zealand, and Easter Island. The Samoa Islands have been populated for 3,000 years, but only known to the Western world for little more than two centuries. The National Park of American Samoa was authorized in 1988 by Congress. It preserves and protects tropical rainforests, coral reefs, fruit bats, and the Samoan culture. In 1988, the National Park Service began negotiations with nine Chiefs in village councils for land on three islands. The negotiations resulted in the 13,500-acre national park being located on the islands of Ofu, Ta'u, and Tutuila. About 4,000 acres of the park is mostly under water. Visitors are welcome at any time. With the islands located south of the Equator, the islands have a hot and rainy climate year-round. If you want to the least chance of rain, plan a trip from June through September. The park is located in a remote part of the South Pacific and requires some planning to visit. The nearest airport is Pago Pago International Airport on Tutuila Island. Currently, Hawaiian Airlines is the only major carrier to American Samoa. The International Airport at Upolo in nearby (Western) Samoa also has several flights weekly from Australia, New Zealand, and Fiji. Connecting flights serve Tutuila from Upolo by small aircraft nearly daily. Inter-island flights are also available. Small planes serve park areas on Ta'u Island and the nearby nation of Samoa. Transportation to the other park area on Ofu Island is by local boat from Ta'u. There are no fees or permits required to visit the park. All people entering American Samoa must pass through American Samoa Immigration and Customs. Passports are necessary to enter American Samoa and re-enter the U.S., as well as check-in on the airplane as flights to American Samoa are considered International. 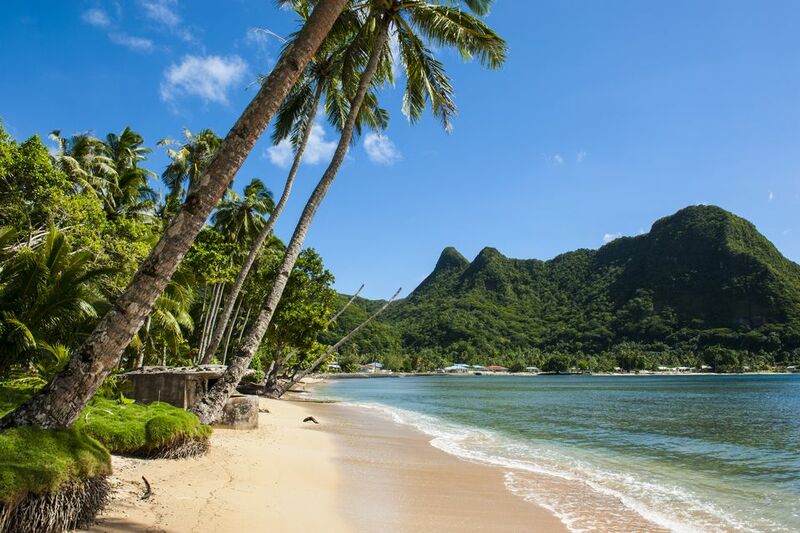 U.S. citizens returning from American Samoa are permitted a duty-free allowance of $800 rather than the usual $400 if it all originated in American Samoa. The best outdoor activities at this park include nature study of tropical wildlife and coral reef marine habitats, and enjoying the many outstanding island and sea landscapes. Snorkeling: Ofu and Olosega have excellent coral reefs and offer the best snorkeling waters in the Territory. Bring your own snorkel gear, especially when visiting Ofu and Olosega. American Samoa is very modest when it comes to clothing so be sure to cover your bathing suit with a shirt and shorts. Hiking: A trail along the maintenance road leads to the 1,610' summit of Mt. Alava. The hike is 7.4 miles round trip and visitors should allow 3 hours for the hike up and 2 hours for the return to the pass. This trail also continues to Vatia Village and can be accessed there. Trails are also available along the Sauma Ridge. Trailheads are located at the Amalau Valley scenic overlook. The lower trail leads through rainforest past some unique archaeological sites while the upper trail joins the ridge where Mt. Alava is located. Two short walks reach World War II historic sites, the Breakers Point and the Blunt's Point Gun Emplacement sites. Beach walking: Ofu and Olosega have extensive stretches of pristine shoreline and are the most scenic seascapes in American Samoa. Birding: The park offers a very rich bird life, including sea birds (terns, boobies, frigatebirds, petrels, and shearwaters), migrant shorebirds (even bristle-thighed curlews from Alaska), and many birds that live in native rainforests. The forest birds include honeyeaters, and tropical doves and pigeons. Specialties include the easily seen cardinal and wattled honeyeaters, and Samoan starling. Pacific pigeons, ground doves, and two species of fruit dove can also be located in the park. Lodging is available on all of the major islands. Homestay lodging is the only type available on Ta'u and Olosega. The Samoan people are very hospitable and eager to share their culture with park visitors. Staying with local families provides a unique opportunity to learn and experience the Samoan culture and lifestyle first-hand. Homestays can be arranged on Tutuila, Olosega, and Ta'u. Camping is prohibited within the park. On Tutuila, other National Natural Landmarks include Vai'ava Strait, Cape Taputapu, Leala Shoreline, Fogama'a Crater, Matafao Peak, and Rainmaker Mountain. 'Aunu’u Island National Natural Landmark is also accessible from Tutuila by a short boat ride. Fagatele Bay National Marine Sanctuary is located on Tutuila and may be reached by boat or trail. Near the city of Apia, the historic home of Robert Louis Stevenson (Vailima), now a museum, and the O Le Pupu-Pu’e National Park are also worth visiting.